New recommendations to help healthcare professionals recognise and assess levels of pain in older people were published in the scientific journal Age and Ageing. The guidelines were developed by the British Geriatrics Society, the British Pain Society, the Royal College of Nursing, in collaboration with researchers at Teesside University, Anglia Ruskin University, University of Bournemouth, Centre for Ageing Better, and the Centre for Positive Ageing. There is growing evidence to demonstrate that chronic pain is more prevalent among the older population and pain that interferes with everyday activities increases with age. 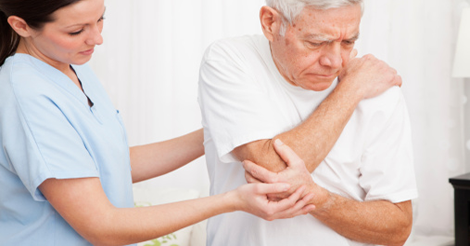 Alleviating pain in the older population is therefore a priority but presents a number of challenges, especially in relation to communication with patients. These guidelines seek to address specific areas in which improvements can be made. To support this aim all existing publications on acute and chronic pain screening and assessment in adults over 60 years of age were identified, and two reviewers independently read and graded the papers according to the National Health and Medical Research Council criteria. Specific areas that were identified as presenting a particular challenge when managing older people’s pain included ‘stoicism’ which can result in the under-reporting of pain, the perception that increasing pain is a natural part of ageing and 10 minute consultations in the UK general practice which often limits older adults from engaging in meaningful conversation about their pain. It was also noted that pain in nursing home residents often goes undetected. These guidelines outline key recommendations regarding the detection and assessment of pain in older adults. Recommendations include recognising the fact that patient self-reporting is the most reliable and accurate measure and this includes older people with cognitive impairment. The guidelines also recommend that although older people often deny pain, the use of related terms, such as soreness, aching or discomfort may provoke a positive response. Re-wording questions to elicit the presence of pain such as “Do you hurt anywhere?” or “What is stopping you from doing what you want to do?” can substantiate the presence or absence of pain. Education and training of staff to recognise pain, and to act on their findings, is a key recommendation of the updated guidelines. It is advised that healthcare professionals be aware of the wide variety of pain measures available and a solid understanding of how and when to use them. Professor Patricia Schofield, Deputy Dean for the Faculty of Health, Social Care and Education at Anglia Ruskin University and lead contributor of the Age and Ageing paper, said: "Pain in the older population has been largely neglected in the past, with the assumption that it is expected as you get older. This document sets out guidelines for the fundamental first step in the process, which is how we identify and measure pain in this population. Hopefully, health and social care professionals will take on board the recommendations and we can move towards more effective pain management in the future."